The practice of communicating with the dead, especially in order to predict the future; witchcraft, sorcery, or black magic in general. The definition given above comes from dictionary.com. For the record, Christians know full well they’re forbidden from communicating with dead people, so Mr. Young’s teachings would make every Christian shrink back in horror at the thought of having dead spirits around them. Furthermore, Christians go directly to the Bible to look for instruction on this type of subject matter. We can read in Luke 16:19-31 that Brigham’s teaching is nothing but a lie. 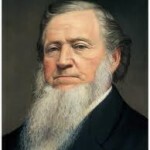 The truth is that Jesus specifically told us just the opposite of what Brigham said. Jesus said Lazarus was in fact in the bosom of Abraham.